Golden Axe was a launch title for the Sega Genesis in North America so it's not one of the better looking games on the platform. The third beat ‘em up my friend and I played through recently was Golden Axe. Like the Streets of Rage games we played beforehand, it was developed and published by Sega, although Golden Axe was released as an arcade game before being ported to the Sega Genesis, the version we played. Tyris Flare facing the first boss of the game. Lucky for her, she's found a cockatrice to ride. Whereas Streets of Rage was set in an eighties or nineties version of a corrupted city, Golden Axe is set in medieval times. The three playable characters set out to rescue the king and princess who has been kidnapped by an evil ne’er-do-well named Death Adder. The plot is typical of the setting, as are the playable characters, a barbarian named Ax Battler, an Amazon named Tyris Flare, and a dwarf named Gillius Thunderhead. 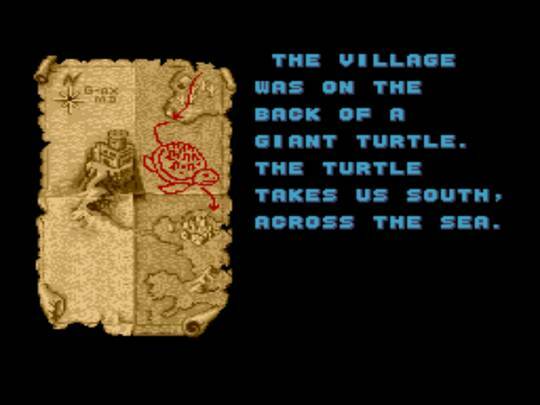 Unlike the plots in the Streets of Rage games where they appeared only as text at the beginning and ends, there are story bits between each level in Golden Axe, marking the progress the warriors make. Throughout the levels my friend and I were attacked by Death Adder’s henchmen. 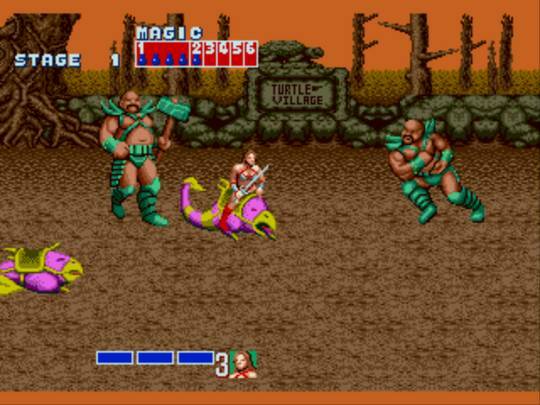 The setting of Golden Axe allowed for the enemies to be more varied compared to Streets of Rage, although there were many who were the same model, just different statistics and a different color. Most of the bosses were repeated throughout the game and towards the end they used unfair tactics, such as the final boss’ proclivity to knocking us down and zapping us with magic, taking two of our health bars in one swoop. And this brings me to my complaint about Golden Axe. Golden Axewas super tough, even playing on easy my friend and I had a difficult time getting to the seventh stage (eight stages total) and we eventually used a cheat code to skip levels. I normally would want to attempt completing a game without the use of cheat codes, but it seemed like we didn’t have a shot. An example of the text displayed between levels. Although it's very simple, I appreciated the extra effort in tracking the warriors' journey. With combos, we could get up to five hits in on an enemy, but it was difficult lining up correctly to do so. And I personally felt like I wasn’t getting enough response after hitting the attack button. I’m not sure exactly why I felt this way, perhaps it was the sound design of the hits, they sounded peculiar, not what I would expect from a metal weapon, or perhaps because I didn’t enjoy the sluggish character movement. Rather than having a single health bar that depletes in differing amounts depending on the strength of attacks, my friend and I were instead given a health bar that consisted of what turned out to be three hits or combos. This made it feel like we had less of a shot just because we couldn’t take a lot of damage, couple that with the enemies’ ability to keep you in their combo if hit and it lead to frustration for both my friend and I. But the most frustrating aspect for us was the difficulty of the final boss. We originally got to the seventh stage before losing our continues. We opted then to use a cheat code to select the final level and another to add nine continues. The final boss took an enormous amount of damage and he was able to evade the bulk of our attacks, and he had a little help with the aid of some invincible skeletons. Later on in the fight, he began using magic after knocking us down, taking out two of our health bars. He was difficult and we used plenty of continues but we ultimately conquered him and saved the king and princess. 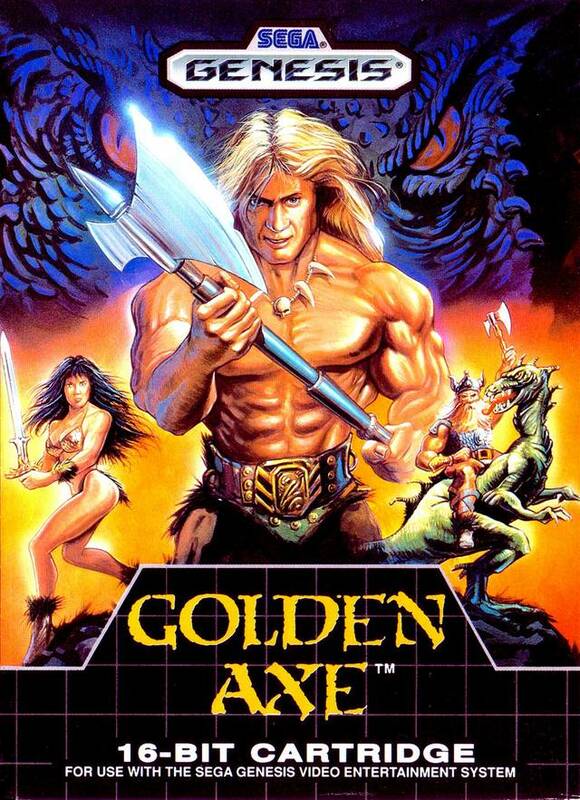 Golden Axe was a mixed bag for me. A lot of the stages had a similar feel, but there were a few that had interesting settings, and they were fairly short which I liked. The soundtrack seemed meager, but the tracks present were phenomenal and I found myself humming them as we played, especially the first stage’s song. I appreciated having story bits throughout the game rather than at the beginning and ends. But I disliked the reuse of lack of standard enemy design and the similar looks of the majority of the stages. And more importantly, I disliked the way the game felt. It’s a hard concept to quantify but it is ultimately what made me like Golden Axe less than Streets of Rage and Streets of Rage 2. Golden Axe was equally filled with parts I liked and disliked and for that I recommend it only to those seeking out another beat ‘em up. I’m probably too big a fan of beat-em-ups to actually give Golden Axe a non-biased review, but I agree that the game was rather low-end built. I think it was at the time, the factor of many other game following an early 90’s/late 80’s style, where it was more about kitchy-ness than actual gameplay. The sounds kind of remind me of the sounds from Conan The Barbarian or Red Sonja, where it was about the swordplay and action. Try the arcade versions, and their later incarnations sometime. Sega just had a lot of IP’s that were just as original as Nintendos, and I respect that they had that sort of rivalry but friendship at the same time. We don’t have console companies working to keep dominance on a certain genre-front like that anymore. I’m looking forward to playing more of the games in the series. After doing some reading, I was surprised to see how many Golden Axe games there are. At least a few never saw a release on a home console so those will be harder to track down and play.